Involvement at an early stage in various aspects of treatment helps prepare the way for the complicated training that may lie ahead. Dietary and drug therapy should be explained. 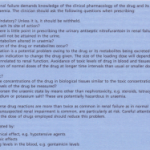 As dialysis and/or transplantation may be required in the future, forward planning may be necessary. The patient’s home may need to be assessed and converted to take dialysis equipment. Job prospects and economic resources need to be considered. 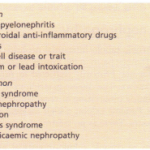 Approximately 100 individuals per million population reach end-stage renal failure per annum. The aim of all renal replacement techniques is to mimic the excretory functions of the normal kidney, including excretion of nitrogenous wastes, e.g. urea, maintenance of normal electrolyte concentrations, and maintenance of a normal extracellular volume. In haemodialysis blood from the patient is pumped through an array of semi-permeable membranes (the dialyser, often called an ‘artificial kidney’) which bring the blood into close contact with dialysate, flowing countercurrent to the blood. The plasma biochemistry changes towards that of the dialysate due to diffusion of molecules down their concentration gradients. THE DIALYSIS MACHINE comprises a series of blood pumps, with pressure monitors and bubble detectors and a proportionating unit, also with pressure monitors and blood leak detectors. Blood flow during dialysis is usually 200-300 ml min “! and dialysate flow usually 500 ml min~l. The efficiency of dialysis in achieving biochemical change depends on blood and dialysate flow and the surface area of the dialysis membrane. Dialysate is prepared by a proportionating unit which mixes specially purified water with concentrate, resulting in fluid with the composition described. A large number of semi-permeable membranes are now available. Cellulose-based membranes are the most widely used and cheapest. The total surface area of the dialyser is about 1 m? while the thickness is about 10 /-Lm. Numerous configurations have been invented; the one in most common use is the hollow fibre dialyser, in which blood from the patient is distributed to thousands of hollow fibres made from a semi-permeable material, with the dialysate flowing around the outside of the fibres . Newer highly permeable synthetic membranes allow more rapid haemodialysis than with cellulose-based membranes (high-flux haemodialysis). Range of concentrations (mmol litre:”) in routinely available final dialysates used for haemodialysis. Adequate dialysis requires a blood flow of at least 200 ml min’. 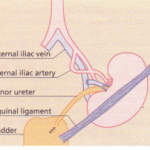 The most reliable long-term way of achieving this is surgical construction of an arteriovenous fistula, using the radial or brachial artery and the cephalic vein. This results in distension of the vein and thickening (‘arterialization’) of its wall, so that after 6-8 weeks largebore needles may be inserted to take blood to and from the dialysis machine. Arteriovenous shunts are large-bore plastic cannulae surgically tied into a superficial artery and adjacent vein. These allow direct flow of arterial blood into the dialysis machine, which is returned directly into a vein. Between dialysis sessions flow between artery and vein is restored by a plastic connector between the two cannulae, which lie outside the body, usually on the forearm. Disadvantages include a high rate of infection, thrombosis and the potential for disconnection which could result in exsanguination. If dialysis is needed immediately, a large-bore doublelumen cannula may be inserted into a central vein-usually the subclavian, jugular or femoral. Semi-permanent dual-lumen venous catheters may also be inserted with a skin tunnel to lessen the risk of infection. Dialysis must be tailored to an individual patient to obtain optimal results. DRY WEIGHT is the weight at which a patient is neither fluid overloaded nor depleted. Patients are weighed at the start of each dialysis session and the transmembrane pressure adjusted to achieve fluid removal equal to the amount by which they exceed their dry weight. THE DIALYSATE BUFFER is usually acetate or bicarbonate. The sodium and calcium concentration of the dialysate buffer are carefully monitored. A high dialysate sodium causes thirst and hypertension. A high dialysate calcium causes hypercalcaemia, whilst a low calcium dialysate combined with poor compliance of medication with oral calcium carbonate and vitamin D may result in hyperparathyroidism. FREQUENCY AND DURATION of dialysis is adjusted to achieve adequate removal of uraemic metabolites and to avoid excessive fluid overload between dialysis sessions. An adult of average size usually requires 4-5 hours’ treatment three times a week if standard Cuprophane dialysers are used. Twice weekly dialysis is only adequate if the patient has considerable residual renal function. All patients are anticoagulated (usually with heparin) during treatment as contact with foreign surfaces activates the clotting cascade. In the UK, many patients have selfsupervised home haemodialysis. Hypotension during dialysis is the major complication. Contributing factors include: an excessive removal of extracellular fluid, inadequate ‘refilling’ of the blood compartment from the interstitial compartment during fluid removal, abnormalities of venous tone, autonomic neuropathy, acetate intolerance (acetate acts as a vasodilator) and left ventricular hypertrophy. Very rarely patients may develop anaphylactic reactions to ethylene oxide, which is used to sterilize most dialysers. Patients receiving ACE inhibitors are at risk of anaphylaxis if polyacrylonitrile dialysers are used. Other potential, rare, complications include the hard water syndrome (caused by failure to soften water resulting in a high calcium concentration prior to mixing with dialysate concentrate), haemolytic reactions and air embolism. This removes plasma water and its dissolved constituents, e.g. K+, Na”, urea, phosphate, by convective flow across a high-flux semi-permeable membrane, and replacing it with a solution of the desired biochemical cmposition . Lactate is used as buffer in the replacement solution because rapid infusion of acetate causes vasodilatation and bicarbonate may cause precipitation of calcium carbonate. Haemofiltration can be used for both acute and chronic renal failure. High volumes need to be exchanged in order to achieve adequate small molecule removal; typically a 22-litre exchange three times a week for maintenance treatment and 1000 ml hour-l in acute renal failure. This is a combination of high-flux haemodialysis, using dialysate made from highly purified water for countercurrent dialysis, plus haemofiltration combined with infusion of replacement fluid. Advantages include a better small molecule clearance than with haemofiltration alone, a good clearance of middle molecules and an excellent haemodynamic stability. However, it is expensive. Continuous treatments are used in acute renal failure and have the advantage of slow continuous correction of metabolic and fluid balance. They are particularly suitable for patients with haemodynamic instability. Blood flow may be achieved either by using the patient’s own blood pressure to generate flow through a dialyser (continuous arteriovenous treatment, CA VH) or by the use of a blood pump to draw blood from the ‘arterial’ lumen of a duallumen catheter placed in the jugular, subclavian or femoral vein, through the dialyser, and back to the ‘venous’ lumen (continuous venovenous treatment, CVVH). CONTINUOUS HAEMOFILTRATION (CAVH, CVVH) refers to the continuous removal of ultra filtrate from the patient, usually at rates of up to 1000 ml hour-I, combined with simultaneous infusion of replacement solution. For instance, in a fluid-overloaded patient one might remove filtrate at 1000 ml hour-I and replace at a rate of 900 ml hour-I, achieving a net fluid removal of 100 ml hour-I. Haemofiltration may have an advantage over continuous haemodialysis of removing cardiodepressant substances which appear to accumulate in acute renal failure and septic shock. CONTINUOUS HAEMODIALYSIS (CAVHD, CVVHD) involves the continuous passage of dialysate countercurrent to the flow of blood. 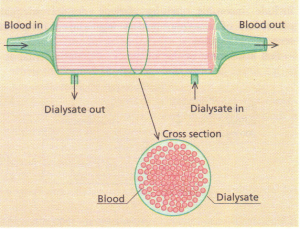 Dialysate is pumped (using an intravenous fluid pump) through the dialysate compartment of a synthetic membrane hollow fibre dialyser at a rate of around 1000 ml hour-I. 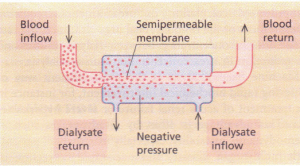 CONTINUOUS HAEMODIAFILTRATION (CAVHDF, CVVHDF) is a combination of haemofiltration and haemodialysis, involving both the net removal of ultrafiltrate from the blood and its replacement with a replacement solution, together with the countercurrent passage of dialysate (which may be identical to the replacement solution). Both the ultrafiltrate and the spent dialysate appear as ‘waste’. SLOW CONTINUOUS ULTRAFILTRATION (SCUF) is the removal of ultrafiltrate from the patient by convection across the dialyser without infusion of replacement fluid or dialysate flow. Fluid is normally removed at a rate of 100-200 ml hour-I. This results in a gradual reduction in plasma volume and is useful for the treatment of severe volume overload, for instance in severe cardiac failure prior to definitive treatment. No biochemical improvement occurs, and this is not really a renal replacement technique, but is mentioned here for completeness. 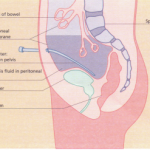 The principles of peritoneal dialysis.